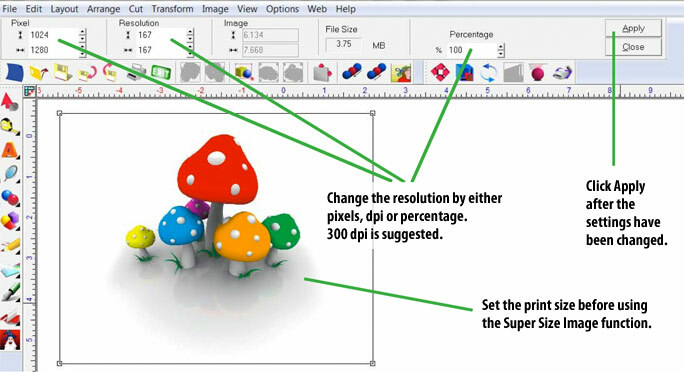 Super Size Image is an image enlargement tool that is used to increase the print size and/or the resolution of an image. First, select the image and from the Image drop down menu choose Super Size Images. After you select Apply, the Zoom Engine window will appear. This is where you can perform extra image quality functions. Preview Image – A thumbnail of the original image is shown in the upper-left corner of the dialog, and a zoomed preview takes up about 2/3 of the right-hand side. Click the original image thumbnail to center the preview. Zoom Level – Click the (+) and (-) buttons to adjust the zoom level of the zoomed preview. Crispy Zoom V1 and V2 – These are versions 1 and 2 of the Super Size algorithm that is used for enlarging images. Crispy Zoom V2 is the improved method that retains greater image quality (e.g., less aliasing, sharper details, etc. ), though the V1 method remains available as an alternative. Edge Crispness – This slider varies in the range of [-100, 100]. Positive values will sharpen the edges between color regions, whereas negative values will blur the edges. Surface Smoothness – This slider varies in the range of [0, 100]. This slider affects the perceived texture of the image. Low slider values allow the image to appear more jagged (e.g.., rough), whereas high values create the impression of a continuous, smooth surface. Soft and Chroma – Note that the Soft and Chroma options are only available if Crispy Zoom V2 is enabled. Tick the Soft check box to create a slight blur that suggests softness within the image. Tick the Chroma check box to increase the color saturation. 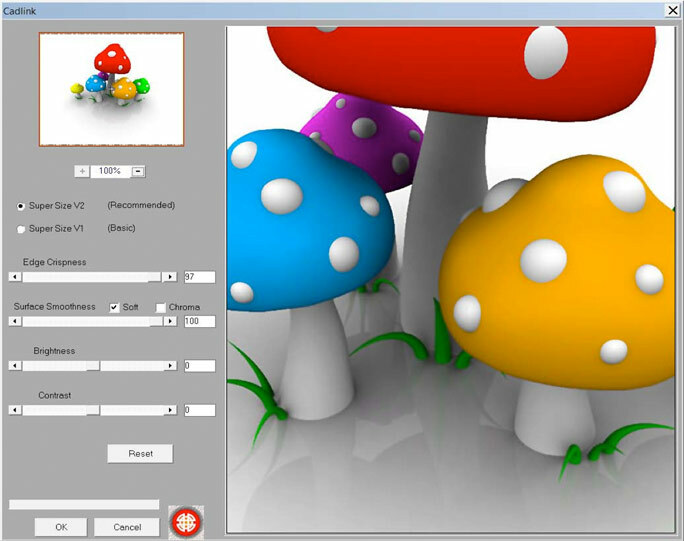 Brightness (-100, 100) – Adjust the intensity of the finished image. Contrast (-100, 100) – Adjust the perceived difference between light and dark regions of the image. Previous post Print On Promotional Items Next post Printing On Apparel: Sunglasses, Watches and More!